It is difficult to be excited about clearing your own clutter. Other people's clutter is easy to deal with and it can be a very exciting process—especially for feng shui-minded people—but there is not much excitement in tackling your own clutter. Knowing this fact should make it easier for you to start your home decluttering process. Accepting that your clutter will be hard to deal with is half the battle. The other half is to use simple and smart feng shui tips to make the battle fun. If you cannot get rid of clutter in your home, this feng shui clutter clearing system is for you. It is powerful, simple, gentle to your well-being, and—most importantly—it really works. In order for this feng shui clutter clearing system to help you, you have to be brave and honest. The more honest you are, the more you benefit from the powerful results of a new, fresh and potent feng shui energy in your home. Identify all your clutter—it's stealing your energy. If your rooms look OK on the surface but your garage or attic is a disaster, acknowledge it. Declutter with a clear feeling that you want to bring to your home. Clutter is low and stagnant. You need to be the opposite to attack it. Plan the time for your clutter cleaning sessions. Limit the first three sessions to no more than 30 minutes each. Plan a treat after every session. Gather the supplies you need. Use three boxes and label them "In," "Out" and "I Don't Know." You'll also need a timer. Place the boxes close to your work area. Pick up an item from your cluttered area and put it in one of the boxes. Repeat until your session time is up. The In box stays in if you have space for each item. The Out box goes out to friends, charity or a garage sale. Close the I Don't Know box and mark your calendar six months in the future. If you haven't needed anything in the box in that time, give it away without opening it up. Using feng shui to clear your clutter can be an exciting process when you understand what clutter does to your life. Clutter is low, stagnant and confusing energy that drains energy from you. Depending on the feng shui area of your home where your clutter is located, it can also negatively influence or completely block the flow of energy in many areas of your life. Focus on three specific areas of your home to tackle your clutter. Bedroom: Remove everything from the bedroom that doesn't belong there, including the TV, exercise equipment, work items and storage items. Clear the clutter under the bed. 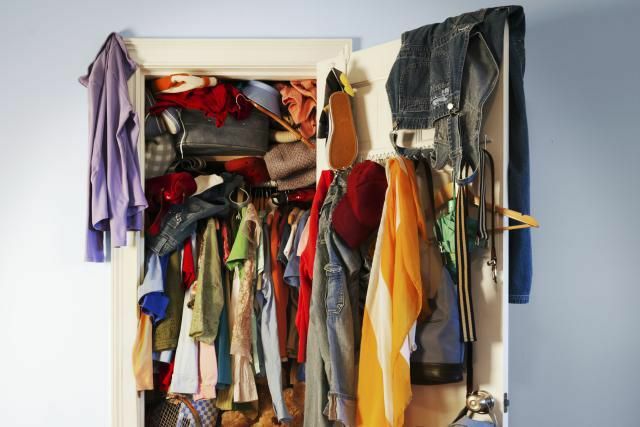 Declutter and clean your closet. Kitchen: The kitchen represents the state of your health in feng shui. Do your health a big favor by cleaning up your kitchen. Start with the refrigerator. You know you need to. Clean the stove and all the pots and pans. Replace the harsh chemical cleaners with natural ones. Clean all the drawers and flat surfaces. Entrance: Your home receives its energy from the front entrance. Remove any objects in the entry area that don't belong there. Set up a system to deal with incoming mail. If you have an entry closet, put only in-season items in it. Add a beautiful item to your front entry to welcome the energy into your home. Spring cleaning and clutter clearing might sound exciting when you think of the results, but not of the process itself. It is Ok to avoid the clutter-clearing process for a while, but if you know that you need to declutter your home, look into feng shui to make the process fun. Open all the windows to admit fresh air and energy. Get dressed in natural-fiber clothing that you feel good wearing. Bring fire element colors to the room you are clearing for an extra boost of energy. Put on music you love and use an aromatherapy diffuser. Start small. Finish the small area before you get tired and then treat yourself. The next day, tackle another small area. Most people think of closets as an "out of sight, out of mind" deal. Not true. Especially in feng shui terms, where everything is energy. It is important to understand that with feng shui energy, the "out of sight" strategy does not work. You cannot cover, conceal or pretend not to see low energy because in feng shui there are no boundaries. Make sure you have friendly and warm lighting in your closet. Give the closet a fresh coat of white paint. Schedule several clutter-clearing sessions to move out old and unused garments. Organize. Use baskets or boxes to set up a system that works for you. Beautify the closet with crystals, jewelry or a photo of a happy memory. The feng shui effect of clutter on your health, your energy levels and the overall quality of your life is obvious—clutter drains your energy and dampens your best intentions. There is a way out, though, and feng shui as an energy tool can help you clear your clutter in the most efficient and enjoyable way. Keep two important guidelines in mind to make this work. Attract higher feng shui energy to support you when you clean. Open the windows to admit fresh air or put on great music. Start small and time your efforts. Plan to underachieve rather than overachieve. Does your child's clutter drive you nuts? If cleaning up after your children seems like a never-ending process, it's time for some feng shui clutter clearing sessions with your kids. Not only you will get help in cleaning, you are teaching your children the importance of keeping their living space uncluttered. Tasks will vary by age, but start in the child's room and eventually you'll be able to include the kids in whole-house decluttering. Assign an under-the-bed cleanup to each child. The trash and treasures they find there create stuck energy. Set up a working storage system for your child in his room, so he'll have a place to put the items he wants to keep. Build shelves inside chests and closets or use crates or bookcases for daily belongings. Give your child a circular bin and have him fill it with toys or stuffed animals. Schedule a decluttering session before school starts to make room for new supplies. Have the kids put toys they don't play with anymore in a box. Seal it, have them date the box and then place it in the garage or attic. If they don't want anything in it in six months, donate the toys. Getting rid of your clutter is no walk in the park, and it can be even more difficult when you share your home with other people. You may not have enough space for all your belongings and are trying to store them in your limited space. However, if you turn your living space into storage areas, the feng shui energy of your home is stagnant and blocked until you remove the storage and open the space. This means finding a different place to store your stuff. There are plenty of storage rentals available. Other than the essentials, box up everything you think you might want to keep and toss out or give away the rest. Take the boxes to a storage facility. After a year (or whatever time works best for you) if you don't remember what you have in storage, give all the boxes away to charity. Your kindness will result in good energy. Clear out the kitchen cabinets. Spring clean your home office. Set up a system to handle mail. Sort through, toss some and save some school papers. Handle all your electronic clutter by clearing email in boxes and setting up smart folders. Finally empty that junk drawer. Toss most of the junk and add a tray to organize the things you want to keep. Focus on trash. Walk through your rooms with a trash bag in hand, focusing on corners that have become invisible over time. You might not be aware of it, but when you walk into a room, you react to it. You may feel peaceful and happy or you may feel tense and sad, all because of the energy of the space. Clutter is a huge obstacle to good feng shui energy. Piles of unread mail and flat surfaces you can't see drain your energy. In feng shui, clearing the clutter in your home leads directly to feelings of relaxation and productivity. How Does Feng Shui Apply to Spring Cleaning?